3rd lunar month of 1862: premiere at the Ichimuraza of Kawatake Shinshichi II's drama "Aoto Zôshi Hana no Nishikie" (commonly called "Shiranami Gonin Otoko"); Hanasuke plays the role of Sônosuke [casting]. 1st lunar month of 1863: Seki Hanasuke I takes the name of Ichikawa Yaozô VI at the Nakamuraza, playing the roles of Danzaburô, Kinuya Yaichi, Sukeichi and the otokodate Mamushi no Jirokichi in the drama "Tamakushige Akebono Soga". 9th lunar month of 1865: Yaozô performs at the Nakamuraza in the dances "Kadomatsu" [print], "Tsuri Gitsune", "Saruwaka" and "Shimbochi Taiko". 12th lunar month of 1870: his adoptive father Seki Sanjûrô III dies. March 1873: Ichikawa Yaozô VI takes the name of Seki Sanjûrô IV at the Murayamaza, playing 3 roles in the drama "Taiko no Oto Chiyû Sanryaku" and the role of Gengo in the drama "Wakaidori Kasamatsu Tôge". He also performs in the dance "Yanagi ni Kaze Fukiya no Itosuji", which mixes Tomimoto, Kiyomoto and Gidayû musical ensembles. 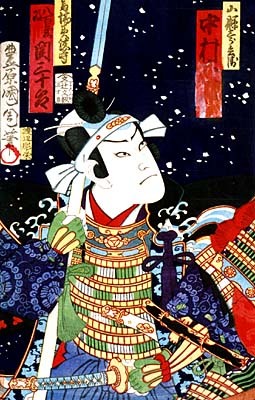 His stage partners are Kawarasaki Gonnosuke VII, Onoe Kikugorô V, Bandô Kakitsu I, Nakamura Tokizô I, Bandô Mitsugorô VI, Ichikawa Monnosuke V, Kawarasaki Kunitarô II, Yamazaki Ennosuke, Onoe Kikunosuke II and Nakamura Karoku II (who celebrates also his shûmei). October 1874: premiere at the Kawarasakiza of Kawatake Shinshichi II's drama "Kumo no Ueno San'e no Sakumae"; Sanjûrô plays the roles of Kataoka Naojirô, Sakurai Shinnojô (in reality Kataoka Naojirô) and Katagi Kozaemon [casting]. October 1875: premiere at the Nakamuraza and the Shinboriza of Takeshiba Kinsaku I's drama "Minori no Aki Seishô Denki"; Sanjûrô plays the roles of Satô Denzô and Fukumatsu [more details]. September 1878: premiere at the Ichimuraza of Takeshiba Kinsaku I's drama "Tsûzoku Saiyûki"; Sanjûrô plays the role of Chohakkai [casting]. February 1886: Sanjûrô plays the role of Senoo Tarô at the Ichimuraza in the drama "Heike Nyogo no Shima". His stage partners are Nakamura Fukusuke IV (Chidori), Nakamura Shikan IV (Shunkan) and Kataoka Gadô III (Tanzaemon Motoyasu). April 1886: Sanjûrô appears on stage for the last time in Tôkyô, at the Ichimuraza, playing the roles of Sudahei and Nishikito in the drama "Shin Kiyomizu Hana no Goshozome". 1886 ~ 1889: Sanjûrô is either on sick leave or on tour. 10 July 1889: he dies in the city of Mito. Seki Sanjûrô IV was a good tachiyaku actor, able to play in either jidaimono or sewamono dramas. His field of excellence was jitsuaku.